Answer: Based on your description, I know exactly what you saw. It’s called a lenticular cloud. For all you meteorologists out there, the official term is “altocumulus lenticularis.” They can form anywhere, but are most commonly seen above large mountains. 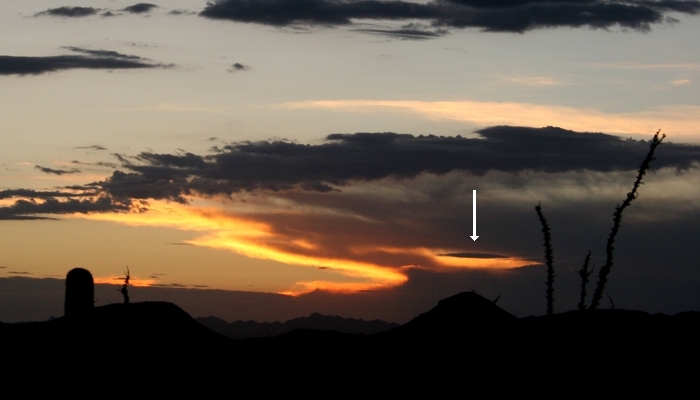 I don’t have any really good photos, since the mountains where I live aren’t that tall, but I did get the above shot of a small one that formed over the Hieroglyphic Mountains just west of my home. The word “lenticular” means “lens shaped,” and that aptly describes their appearance. In fact, scientists believe lenticular clouds are responsible for many UFO reports. Their shape can be so symmetric, unlike most clouds, that it’s hard to believe they’re just a natural phenomenon. Check out this gallery of images. As with all clouds, they require moist air to form. But when the flow of air over a mountain is especially smooth, with little turbulence, you can get these amazing shapes. They’re accompanied by strong updrafts, so most pilots try to avoid them, but gliders seek them out for exactly that reason. Lenticular clouds can be huge, as you probably noticed in that image gallery. 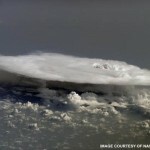 The thumbnail below shows one with a diameter of about 50 miles, formed over the Senegal-Mali border in western Africa. It was photographed from the International Space Station (ISS) in 2008. 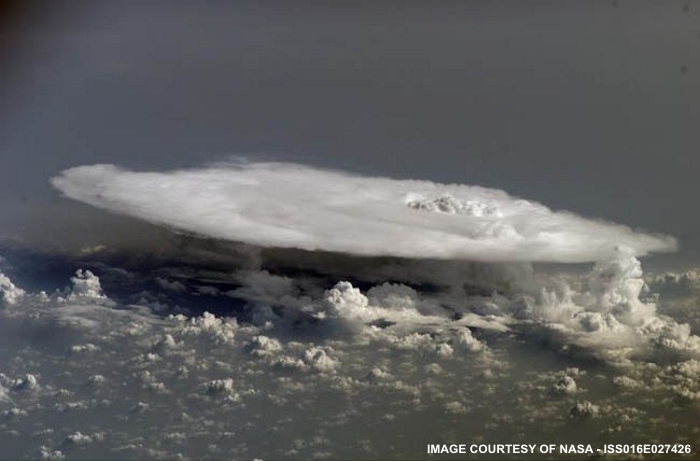 NASA categorized this as a cumulonimbus cloud, but it’s borderline lenticular. Click on it to enlarge. Most of us recall, as children, seeing shapes in clouds. Since your typical cloud is shaped by highly randomized air motion, if you look often enough, you’re bound to see a shape you recognize. I saw one once that looked like a “flying pig.” If you’re interested, check out my August 8th 2007 post. And excuse the grayscale image, but that post is from back in the newspaper era of Sky Lights, when I couldn’t use color images. Have fun cloud-watching!